Blog from Delhi, India | Harper goes to France! We said goodbye to our island and were off to our new adventure early this morning. 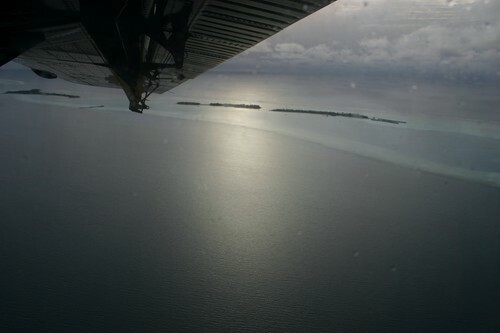 Our sea plane left around 6:50 to get us to Male for our 10:00 flight to Dubai, then on to New Delhi, India!!! So the first week of the honeymoon was for relaxing, a place Wes always wanted to go. Now we are on an adventure in a country that I have always wanted to come to. We landed a few hours ago and the airport is busy, chaotic, and a blur of colors, just as I pictured it. I did have some second thoughts in the cab ride over from the airport, no driving in the US is anything like what we just had. Crazy, crazy cabbies!!! Forget about the Maladone, I told Wes the travel nurse should have prescribed me some Zanex to make it through these cab rides. Just when I was ready to scream, we pull up to this amazing 5 star hotel, Le Meridian, that my marvelous husband chose, knowing that after a day a traveling, and when adjusting to the new culture, his wife would want a little pampering.